Hashimoto’s Disease is an autoimmune disease of the thyroid. Like other autoimmune conditions, a patient’s own body mounts an immune response targeted at its own tissues or glands — in this case the thyroid gland — in the same way it would against a virus or other invader. Antibodies directed against the thyroid lead to chronic inflammation and eventually impair the gland’s ability to produce the hormones necessary for regulating metabolism, staying warm and maintaining function of the brain, heart, muscles, and other body organs. Hashimoto’s Disease can cause symptoms like excessive fatigue, unexplained weight gain, constipation, increased sensitivity to cold, dry skin hair and nails, and low mood disorders. 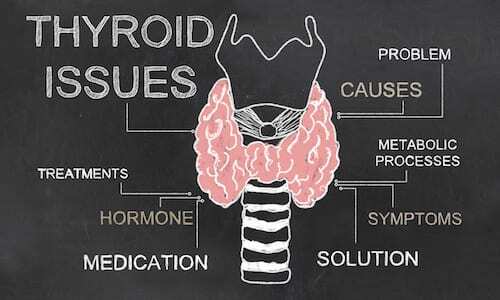 Because of the similar symptoms, it is often mistaken for hypothyroidism. The only way to tell the difference is to run the appropriate antibody tests. Having thyroid autoimmune disease can drastically affect a person’s quality of life, but there are a number of different lab tests available through functional medicine that can both reveal the stage and the underlying causes of the disease’s progression. Blood chemistry analysis using functional medical ranges that highlight low- and high-normal readings vs. the diagnostic lab range typically used in conventional medicine that only triggers alarm if outside a more narrow “normal” range. Adrenal function and/or hormone testing that can determine if the patient has imbalances or trouble producing or metabolizing certain hormones that may be negatively affecting thyroid health. Food or environmental sensitivity testing to alert doctors to food, chemical or metal substances that trigger an inflammatory immune response. Microbiome evaluations that can reveal whether or not poor gut health, such as leaky gut, bacterial or yeast overgrowth, or the presence of intestinal parasites may be contributing to autoimmune disease of the thyroid. The appropriate test or tests often depend on a patient’s individual symptoms, as well as their health and family histories. If you are experiencing symptoms of thyroid autoimmune disease, it’s important to receive proper testing to determine the underlying cause and to prevent further thyroid damage. Talk to a specialist at Infinity Wellness Center about functional diagnostic and treatment options.